Stumbling upon a pile of cash might be an easy way to get rich quick for some, but being the kind of person who turns in lost money has its own rewards, too. There’s the satisfied feeling one might get from being a good human… and also there could be the gift of food, like the guy who scored free Domino’s pizza for a year after returning a wad of cash he found stashed in his box of wings. A Domino’s customer in Berkeley, CA had ordered a pizza and wings from Domino’s and had himself set up for a relaxing day off, reports ABC 7. After eating just a slice of the pie, he stashed the rest of the food in the fridge as he apparently got called in to work. A few hours later he noticed someone was trying desperately to get in touch with him — the Domino’s delivery driver who’d dropped off the wings and pizza earlier. 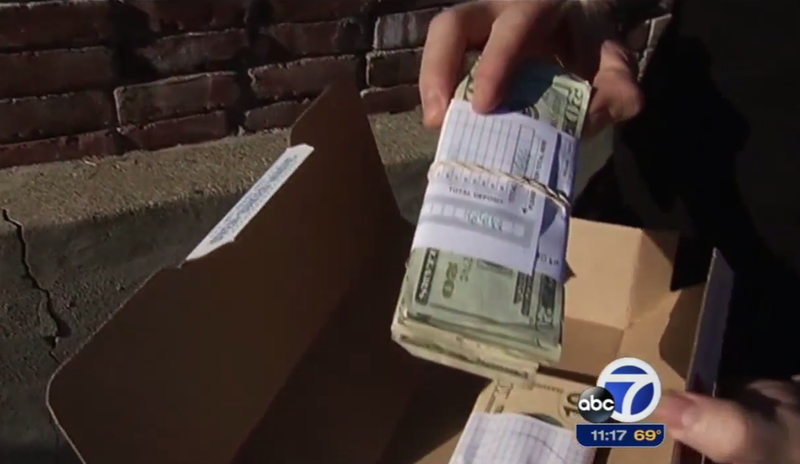 When he finally got home at 5 a.m., he went to his refrigerator, pulled out what he thought was a box of wings… and found about $1,300 stowed in the box, placed there by the delivery driver for safekeeping on his way to the bank. Though some of his friends on Facebook commented on a post he wrote about his find urged him to keep the money, he decided he couldn’t do that. He walked it back in to the restaurant along with ABC 7. “Just to thank you, we’re going to offer you free pizza for a whole year,” he added. The customer is ready and willing to take the restaurant up on the offer. “I’m going to have to start working out more, obviously,” he added. Previous I’ve Been Forced To Sign A Bogus Credit Card Bill While Traveling Abroad. What Can I Do?